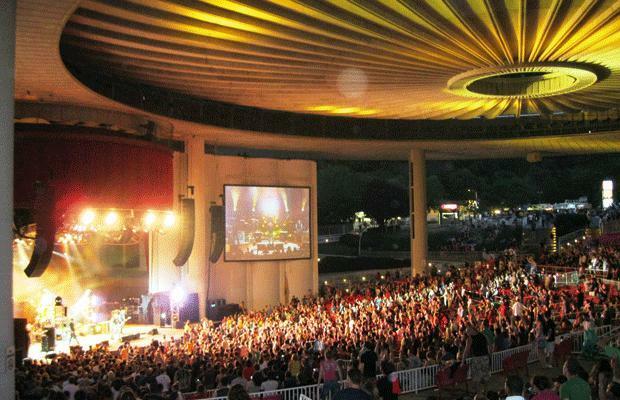 Voted in the TOP 5 theatres in America, the PNC Bank Arts Amphitheatre is a premier venue, with a mega seating capacity of 17,500, with the grass areas allowing for a whopping 10,500 people! The Amphitheatre was originally named Garden State Arts Center. The amphitheatre was designed by noted modernist architect Edward Durell Stone and featured open sides covered by a 200-foot (61 m), saucer-like roof supported by eight large concrete pillars. The Garden State Arts Center first opened on June 12, 1968, with a program featuring pianist Van Cliburn, conductor Eugene Ormandy, and the Philadelphia Orchestra. Mayhem Festival, The Uproar Festival, The Gigantour, The Area:One and Area2 Festival, Ozzfest, Projekt Revolution, Crüe Fest and Crüe Fest 2. PNC Bank Arts Center features one of the most extravagant drive through light displays in the tri – state area. The spectacular is a 2.5-mile (4.0 km) drive through a forest of lights. Over 5 million lights were used over 225 displays. The Light Spectacular usually runs from the end of November through January 2. You will not see anything like it in the surrounding area and is worth checking out, even if you are not attending a show! Stay tuned every month for regular events listings, sign up to our newsletter and get the news before anyone!